Student journalists at the Mississippi Youth Media Project, MPB's partner in dropout prevention, are busy editing news packages. Each group works to complete a package consisting of a lengthy feature news story in a corresponding high-quality photojournalism layout, a short mini-documentary, and a podcast. In the final week of the Youth Media Project summer program, student groups present finished news packages. In the past few weeks, students focused on video editing, which started with a group of student journalists who volunteered to cover the local inauguration in Jackson on their day off, Monday, July 3. Prior to attending the inauguration and shadowing the subsequent administration of the capital city's newest mayor, students interviewed Chokwe Antar Lumumba in the YMP newsroom and edited a video of the interview. Students received initial video production training from MPB videographer/editor, Aden Brown, to equip them for independent project work. Student journalist, Kenytta Brown, wrote an opinion piece, posted online at jxnpulse.com, after his coverage of the inauguration festivities. After seven city council members took their oath of office, Lumumba officially became mayor. He put his left hand on the brown Bible his wife was holding, raised his right hand high and took the oath as Judge Latrice Westbrooks administered it. Lumumba then gave an inspiring inaugural address. He talked about his father, Mayor Chokwe Lumumba Sr., who died less than a year into office four years ago. “A son only holds his father’s hand for a short while, but he holds his heart forever,” he said. Gov. William Forrest Winter addressed the audience in taped remarks right after Lumumba finished his speech. The former governor, who is white and dedicated to bettering race relations, said he had lived in Mississippi for nearly 100 years and has seen much change. “I’ve never been more proud to be a citizen of Jackson than I am now,” the 94-year-old said. Student journalists then spent the entire Friday, July 14, following Lumumba during his early days in office. The group began at the Jackson Police Training Academy, where students observed Lumumba speak to the Youth Citizens’ Police Academy and award certificates to young graduates of the program. 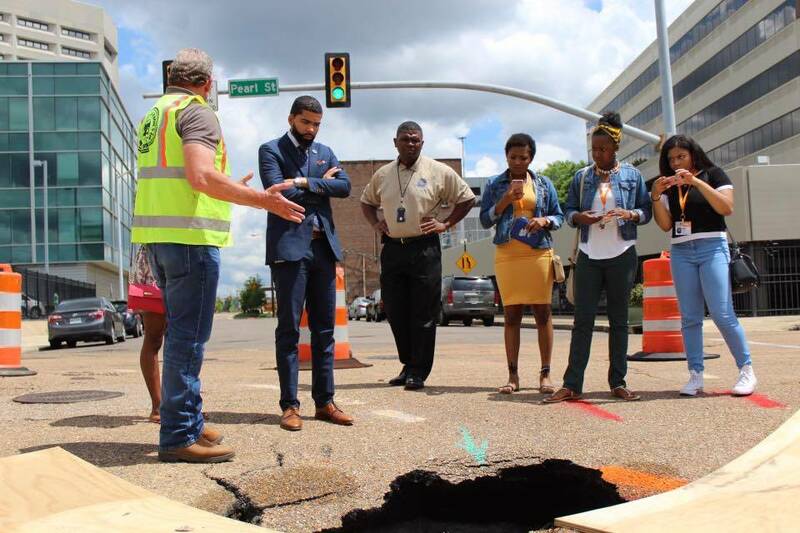 After the ceremony, students then traveled around the city with the mayor and Public Works employees as infrastructure issues were addressed. To prepare for editing mini-documentaries, students schedule multiple interviews with sources across the state and locally around Jackson. This week, YMP student journalists met with Secretary of State Delbert Hosemann to talk about what industries thrive in Mississippi and the benefits and challenges of owning a small business in Mississippi. Another group of students working on a news package about youth crime interviewed Johnnie McDaniels, Executive Director of the Henley-Young Juvenile Justice Center in Hinds County. The group discussed solutions for youth violence, a social issue important to many of the student journalists in the program. Groups will spend the next few weeks editing interviews to produce the mini-documentary and podcast portions of the final news package. Each news package will use rigorous solutions journalism to tell compelling stories about relevant community issues. You can follow more student work online, including blog posts and journalism work. If you have questions about the Mississippi Youth Media Project, or would like to learn how you can help YMP, please email info@youthmediaproject.com. Can we build it?...Yes we can!